Innovation policies as well as entrepreneurship related policies are a key pillar of the EU "Lisbon Strategy", the economic development policy of the EU endorsed in March 2000. In a forest policy context, the MCPFE(Ministerial Conference on the Protection of Forests in Europe) has recently adopted the Vienna Resolution on the “Economic Viability of Sustainable Forest Management” calling for the strengthening of innovation and entrepreneurship in this sector. The main objective of COST E51 is to develop knowledge that enables integration of innovation and development policies for a more effective and sustainable development of the forest sector. View the full conference online! COST E51 ran from March 2006 until March 2010. The workplan is described in the Memorandum of Understanding for the implementation of a European Concerted Action designated as COST Action E51 "Integrating Innovation and Development Policies for the Forest Sector". 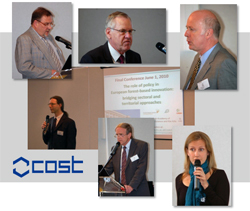 The MoU can be downloaded from the COST website.